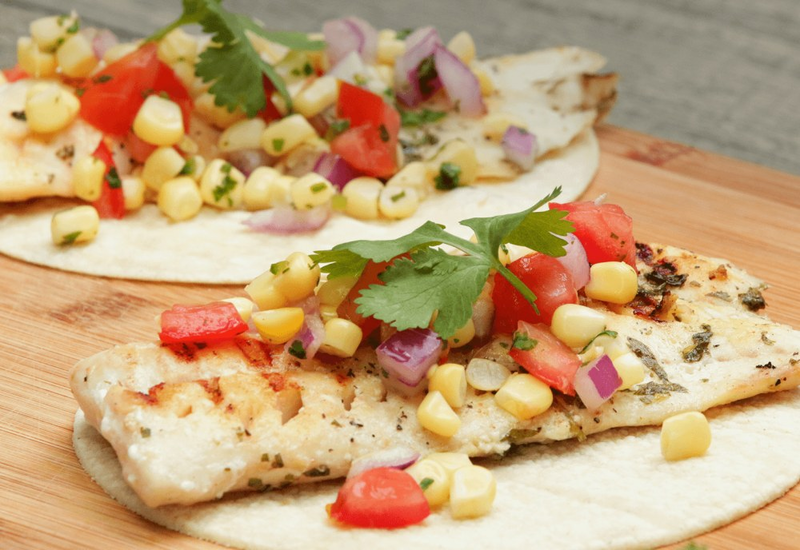 Simple and fresh, these fish tacos come together quickly and are perfect for summer grilling. They are not only great for entertaining but they are effortless enough to make any weeknight meal special as well. Halibut is simply seasoned with a marinade of lime, cilantro, salt and pepper. Meanwhile, it's easy to whip up a fresh corn salsa with red onion and spicy jalapeno. Be sure to serve with extra lime wedges to give that final squeeze before diving in! To make this dish vegan, substitute grilled zucchini and summer squash for the fish. Don't marinate; simply drizzle with olive oil and season with salt and pepper before grilling. You can also add a few slices of avocado for additional wow factor. Per Serving: 454 calories; 6g fat; 44.4g carbohydrates; 57g protein; 136mg cholesterol; 431mg sodium. Halibut was a bit too pricey for me so I opted for cod. The tacos were really tasty and refreshing. Corn was the perfect added bite needed for this recipe. These tacos were very easy to make will definitely make them again. However, because I like to cheat on my diet sometimes, I will try beer battering the fish and deep frying them. Aside from me trying to deep fry these later, this recipe is now a gluten-free staple in my household. I made this recipe for my wife, it was her first time having halibut and she loved it. Grilling the fish is easy, straight to the point. My favorite part of this recipe, though, is the corn salsa. It's so good, I would eat it by itself or with chips. I definitely want to make these again. Making a gluten-free diet fun can be a bummer sometimes, so was thrilled to see this easy receipe for fish tacos. I had snapped in the freezer so used that and topped with pickled onions. Delish! I used cod for these grilled fish tacos, and they were amazing! Also, instead of using an outdoor grill I seared them in a cast iron skillet. Easy and delicious. I wish the corn would have been grilled instead of boiled in a pot. Next time I will grill corn on the cob, and just scrape the kernels off for the salad. Great flavor though, and halibut was the perfect choice of fish.